Is It True That the World’s Largest Animal Feeds on the Smallest? The whale is the world’s largest animal, yet it feeds on some of the sea’s smallest creatures, plankton, tiny ocean plants and animals that drift in the sea. 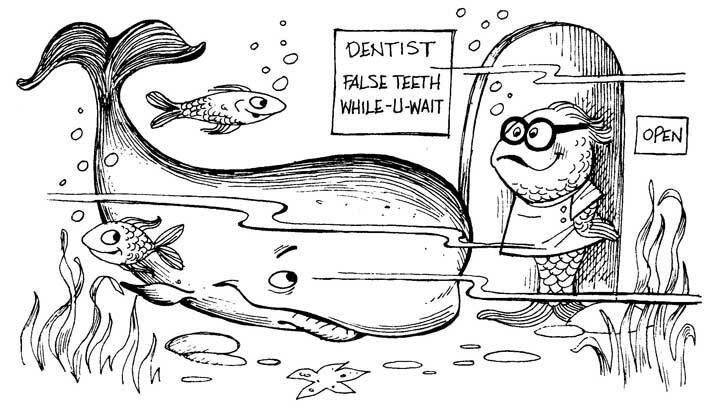 There are two kinds of whales: toothed whales (with teeth) and baleen whales (without teeth). Toothed whales eat fish, squid, and other sea animals. They use their teeth to capture their prey. They do not chew them with their teeth, but rather swallow them whole. Baleen whales, however, have hundreds of small plates, or sheets, hanging from their upper jaw instead of teeth. These plates, called baleen, are made of the same flexible material as your fingernails. What the baleen does is to serve as a filter to strain out the tiny food particles in the sea as the whale swims into the mass of plankton with its mouth open. Baleen whales, which are mammals with lungs, can stay underwater for as long as 40 minutes without coming up to the surface to breathe in air. What Are the Largest and Smallest Birds in the World? What Are the Largest and Smallest Breeds of Dogs?